Inside of my blog “Using JMS queue inside of an aBPM scenario” was shown how JMS queues can be used inside of an aBPM scenario. Surely you can use external tool like HermesJMS to look inside of queues and copy JMS message/s from an error queue to the non-error queue, but in some environments it is not allowed to connect your HermesJMS directly to the productive system. The access is restricted and only allowed from so-called hopping systems. The task to connect to those remote systems and opening the HermesJMS studio is very circumstantial and time intensive. For a better monitoring or a better operation maintenance it would be very helpfully if the PO system sends notification mails to a group of administrators to inform if the administrator has something to do. 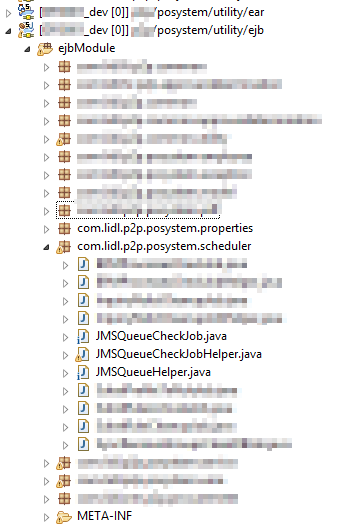 In case the administrator doesn’t get any notification the system and the JMS queues are fine. In this blog I show an very easy approach for using the JMS queue browser API, application properties and a Job implementation to build and prepare notification mails that will be send to a specific group of users. Hint: The mail implementation for mail templates and sending via AEX and/or Java mail service is not part of this article. Developing and Scheduling Jobs gives information about Job implementation. The job defintion of this job contains two job import parameter for the recipient/s of the notification. The first parameter is the unique name, the second parameter is the type (user or group) of the recipient/s. This is relevant to extract environment specific properties that can be configured by an administrator. In context of this article the JMS virtual provider/JMS queue name/s, etc. can be extracted into a single point of configuration outside of the source code. Using Java Message Service gives much background information about JMS inside SAP AS Java. The important fact of the JMS queue browser is that this class does not acknowledge the JMS message from the JMS queue. That means the original message will be read and not consumed from the queue like other message consumers does, e.g. a MDB (message driven bean). So with the JMS browser you get access to the queue for monitoring and investigation purposes. Inside of package scheduler exist some classes that contains the Job implementation and a JobHelper implementation to scan the message inside of the queues. This class contains the message driven bean for the Job implementation. The execution can be planned via NWA Java scheduler. The onJob() operation trigger the read of the application properties, triggers the JMSQueueCheckJobHelper.java to scan the queue content. 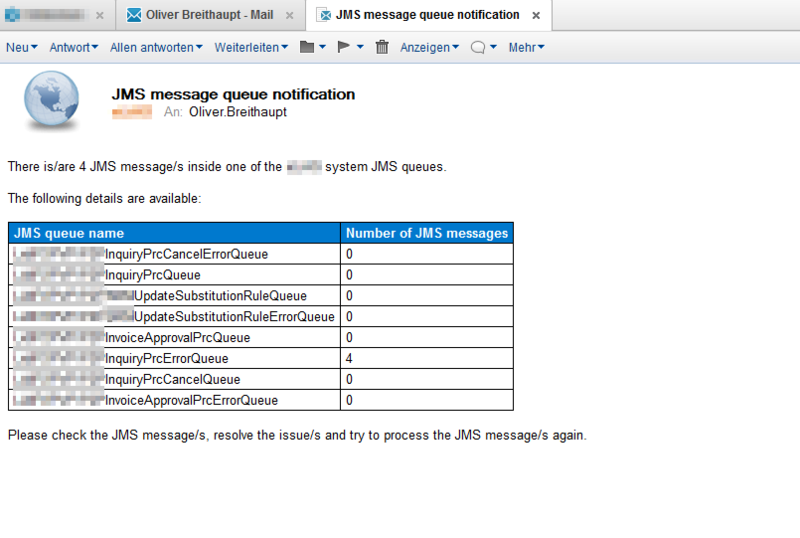 In case minimum one message is inside one JMS queue a MailDto with parameters will be prepared. The prepared notification will be send via Mailmanager (an implementation class that persist or send mails – alternatively an implemenattion can be called that send mails via Javamail service). This class creates access to the JMS queue via queue browser and checks if the JMS queue has elements. The result will be filled into a HashMap. description="Job to check messages inside JMS queues and send notifications to mail recipients"
description="The MailPrincipalIDs are the unique names (logon names) of the recipients who gets the notification mail, multiple ids are allowed, the delimeter is a comma without blank spaces (e.g. 'id1','id2')"
description="List of types for the corresponding principal ids. Allowed values: user, group. Multiple types are allowed, delimeter is a comma without blanks (e.g. 'type1','type2'), size must be equal"